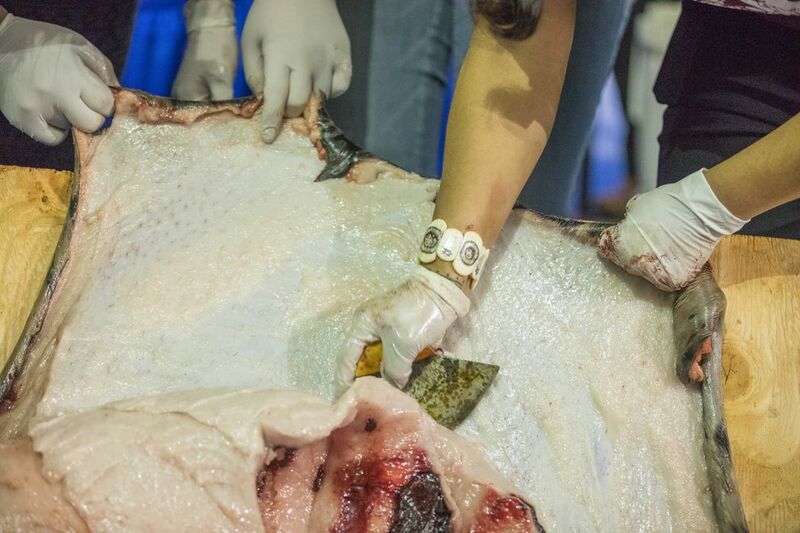 FAIRBANKS — She didn't have her big ulu or her special slanted board but Marjorie "Kunaq" Tahbone smoothly sliced blubber and meat from a ringed seal before an audience Monday during a hands-on lesson. Not many conventions offer food workshops like this one at the First Alaskans Institute Elders and Youth Conference. 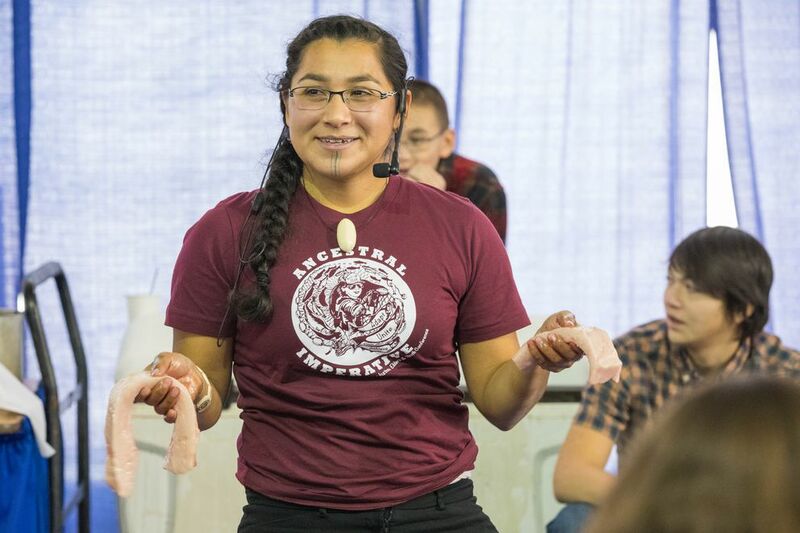 The topic was "Food Sovereignty: Working on Seal" and the lead instructor in caring for the animal was Tahbone, a skilled 27-year-old who calls herself "an elder in training." The ringed seal, or natchiq in Inupiaq, was hunted in Whittier a few days ago. 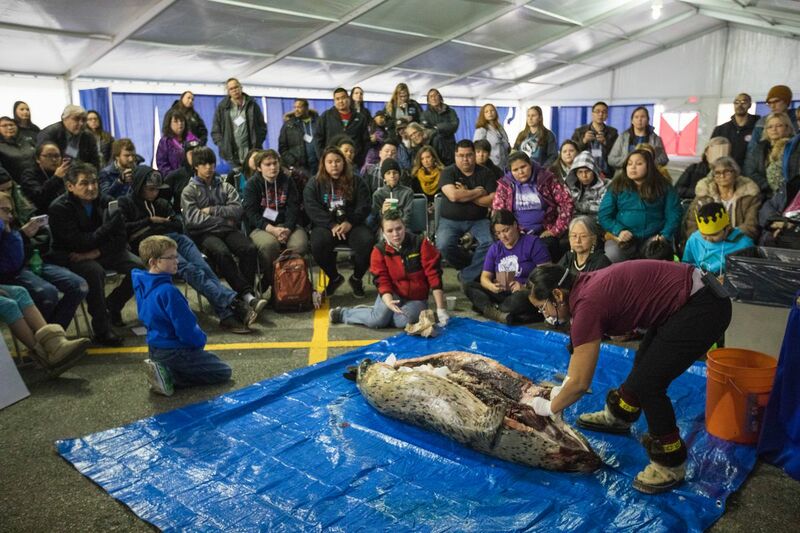 Tahbone, with help in the butchering from Lyle James of Juneau, had everything on hand to teach the basics: how to render blubber into seal oil, how to stretch the skin for sewing, how to make seal soup from the blood-red meat. The practical lesson, one of a number of "Living Our Culture" workshops as the conference kicked off its first day, covered deeper ideas too. "Our seal is basically a center of our lives," said Tahbone, who grew up in Nome in a family who lived by subsistence. "We've made songs for them. We've made prayers around these animals that give us clothing, that give us nourishment, that give us heat, that give us light." She learned to process seal as a young girl and at age 16 first did it alone. The men hunt and women do the rest. "The moment the seal touches the shore it becomes our duty to take care of it," Tahbone said. Step one, she said, is to respect the animal in death as in life. Don't shove the carcass with your foot. Cut its eyes so it doesn't have to see the butchering. Maybe give it a bit of snow or water for a last drink. "Their spirits are still alive," she told the people young and old in the chilly tent pavilion. Treat the animal well, and its spirit will tell others and bring success in future hunts, she said. Before she started, helpers sopped up the animal's blood from the blue tarp that was her work station. It's disrespectful to butcher on a dirty space, she said. She asked for volunteers to help and eager young people stepped up. "It felt so good to help cut the seal," said Ben Hunter-Francis, 18 and a senior at West High School in Anchorage. His family has roots in Marshall and other Lower Yukon River communities. His family gets seal from village relatives but it arrives in Anchorage jarred or sealed in vacuum bags or maybe a big plastic bag. He had never worked with a whole seal before. He felt the power of all that Tahbone was saying as he held it while she cut away the meat. "In my head I was thinking I should do it," he said. "You don't get a second chance to do this." Tahbone explained as she worked her ulu between layers. "First, we separate the blubber from the carcass," she said. "What my mom always told me was that it is better that you leave meat on the blubber than to leave blubber on the carcass." That's because when the meat is dried or otherwise processed, blubber left on it will turn rancid, she explained. She cut off flippers and said they are delicious too. They also can turn into a children's game. Boil them up to get the meat off the bones. Children then see who can collect the most bones, trying for enough to represent a family and a sled dog team. All the meat must be cut off the blubber too, so that when it is rendered, the oil is clear and not yellow, she said. In the far North, where it's dry and cold, the blubber is cut up and put into a bucket, where gradually over a month the oil oozes out. But in Southeast, the blubber is heated to render into oil, a process that James was leading with a portable burner in the pavilion. What parts can you eat raw? a man asked. All parts – meat and blubber, Rahbone said. What do you season it with? For a fresh-seal soup, just use salt and pepper and throw in carrots, onion, celery, potatoes – whatever you like, she said. The ringed seal, though not as big as a bearded seal, was heavy. Rahbone said she worked out at the gym to prepare for seal processing this year. Some traditional strength games help train too, like Indian stick pull. "These games are meant for activities just like this," she said. Tahbone, named Miss World Eskimo Indian Olympics in 2010, lives in Anchorage now and is pursuing her master's in cross-cultural studies at the University of Alaska Fairbanks. She spotted an expert seal-skinner from WEIO in the crowd, Charles Brower of Barrow, which is going back to its Inupiaq name, Utqiagvik. He can skin a seal in one minute nine seconds. But even at age 66, he is eyeing the record of 57 seconds, set in 1969. What Tahbone is doing is terrific for the youths, he said. The workshop ended but a few people stayed on as Tahbone continued to scrape blubber from the skin. Her goal, she said, is to become the best elder she can be.